Rep. Allen West “Stand with me and take a stand against the politics of personal destruction” Reprehensible! Disgusting — that’s the best word that can be used to describe the latest attack ad funded by my Democrat opponent Patrick Murphy’s father. I spent my life in uniform fighting for our great nation and protecting all Americans. The ad being run against me by my opponent’s family depicting violence against women and senior citizens is reprehensible. It plays on stereotypes and fear to divide Americans, and it cheapens the very real and tragic occurrences of violence against women and seniors. Stand with me and take a stand against the politics of personal destruction. The American people are suffering from crushing debt, horrific tax and regulatory policies, and epic unemployment. This classless ad shows a lack of regard for the issues plaguing our nation. This ad reflects the sad state of politics in our Republic with those who seek to destroy a person’s character to cover for their lack of intellectual ability and integrity. Liberals have proven they will stop at nothing to defeat me in November. Help send the message you’re ready to fight back. Will you donate $35 or more to take a stand against these shameful ads? P.S. We still need your help to reach our $50,000 goal by Tuesday. Now is the perfect time to donate and take a stand against these reprehensible attacks. 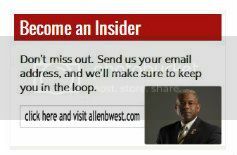 Donate here: https://www.allenwestforcongress.com/contribute. This entry was posted in Election News 2012 and tagged AllenWest, Americans, Attack ad, Congressman Allen West, Democrat Patrick Murphy, Democratic, Elections 2012, Florida CD18, LTC Allen West, Member of Congress, November, Patrick Murphy, Rep Allen West, Super PACs, United State. Bookmark the permalink. Its a shame that some go too far in their attempts to tear apart grood people who stand up for all the right things. But then again that’s the Progressive Liberal Lefts way of doing business in politics. But what’s even more disturbing is when our own party begins attacking each other to win an election. Especially when it is a GREAT man with his background, they are getting very desperate. That is a good sign he is doing something very very right!